The Salween River is the last major free flowing river in Southeast Asia, and it is currently under threat from mega hydropower dam projects. If we do not protect the Salween River, we will hear the sound of the people crying and we will see communities along the Salween River suffering. The Salween River originates from China and flows through Thailand and Myanmar. In Myanmar, the river runs through Shan State, Karenni State, and Karen State before it empties at the Andaman Sea in Mon State. The Myanmar government has proposed six large dam projects on the Salween River with a total installed capacity of 15,000 MW. Among them are the Mongton Dam in Shan State, the Hutgyi Dam in Karen State and the Ywarthit Dam in Karenni State. Most conversations, it seems, when talking about the Salween dam issues focus on the Mongton Dam and Hutgyi Dam, while the Ywarthit Dam is usually excluded. Considering its significant potential impacts on the Karenni people and its alleged capacity of 4,500 MW, which is in fact far larger than the Hutgyi dam of around 1,500 MW, it is crucial that the Ywarthit dam also be a part of the conversation. This conversation needs to take place urgently before any construction might begin. Karenni State is one of the richest regions of Myanmar in terms of its abundant natural resources and lively communities. With a total population of 360,000 people, it is home to nine main ethnic sub-groups as well as many other small ethnic groups. People in Karenni State have traditionally relied on agriculture for their livelihoods, with their main crops being rice, maize, sesame and groundnuts. Many Karenni people rely heavily on the Salween River for drinking water, riverbank farming, fishing and transportation. 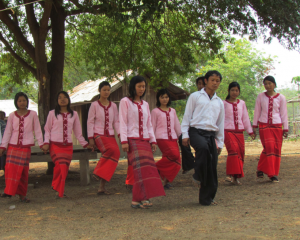 Moreover, culture across Karenni State is closely linked to the abundant forests and the Salween River. The location of the Ywarthit dam. If built, the Ywarthit dam would bring many negative impacts to the communities’ livelihoods, culture and environment. 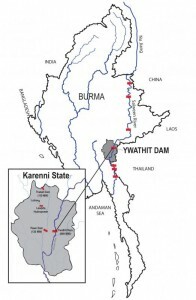 The Memorandum of Understanding (MoU), signed by the Myanmar government, states that the project would be 600 MW in size.1However, according to the project’s developer, which is China Datang Overseas Investment Company, they state that they plan to install a dam with a capacity of 4,500 MW.2 The difference is enormous. In around 2007, Shwe Taung company started a feasibility study in the area and then the Myanmar government proposed the Ywarthit dam in 2010. After 2010, a construction company came to the project site and tried to start construction. However, due to the lack of peace in the area the project was postponed in 2012. Since then, construction has not restarted. However, construction materials and a worker’s camp remain at the dam site. Local people know almost nothing about the project. This even includes village chiefs who explained to the author that they know very little about the project. One of the village quartermasters from the area said: “We did not know about the dam. We only know that the company carry their construction equipment and pass through the village”. It is clear that both the company and the government have failed to follow their obligation to respect the rights of local people to free, prior and informed consent (FPIC) about the project. The small number of people who do know about the project mostly disagree with the plan. However, there are a few people who believe that the local economy could improve and their living standard would be better because of the dam project. They look forward to getting the electricity as well. But what they don’t realize is that the project plans to sell most of the electricity to Thailand and China. The Ywarthit Dam project will cause negative impacts on the local culture that thrives in the region, as well as on the environment. Areas along the Salween are home to thick forests that are rich in biodiversity. The lives of Salween communities are deeply interconnected with the forests and the river. But they will be submerged under water if the dam is built. Despite these readily anticipated impacts, the project lacks even an environmental impact assessment. A major cause for concern is the dam’s impacts on the indigenous Yin Ta Lae ethnic group who number only around 1,000 people. If the dam is built, the Yin Ta Lae communities would have to be resettled. The devastation caused by resettlement due to the dam could wipe out their culture forever. 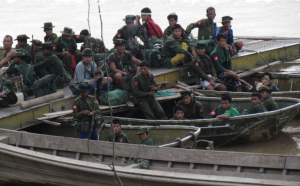 Furthermore, logging is already a problem along the Salween River. As the Ywarthit Dam will flood upstream areas, including all the trees, the project could increase logging not only in the reservoir before flooding but also in the wider area. This logging is not a benefit to the local people, but only for the project developer and the government. Meanwhile, if the dam is built, forest areas once important to peoples’ lives would be left underwater. The dam site is located in a conflict zone. In 2012, the ethnic armed group in the area and the Myanmar army signed a ceasefire agreement, the area is still not totally peaceful. The Burmese military has now set up a new base in the project area. In this situation, Karenni refugees along the Thai-Myanmar border cannot return to their own lands. The Thai government is pressuring them to leave, but under this militarized context they think that there is no guarantee for their safety on the Myanmar side if they were to return home. Meanwhile, the Myanmar government has not provided them with an adequate resettlement plan, especially if their agricultural land is threatened by the proposed dam project. One of the ethnic armed groups in the region, the Karenni National Progressive Party (KNPP), strongly disagrees with the project. So at present the project is postponed for now. But no one can say when the project will resume again. The threat to the Salween River is not only a problem for communities living along the river, but to many other people in the entire Salween Basin. The proposed dam project would increase logging and deforestation. This could change the local climate, for example raising temperatures in the upstream area. More broadly, the loss of biodiversity should be a global concern. The project would also change the Salween River’s hydrology, and could limit farmers’ access to water making it more difficult to farm. Similarly, it would affect fisheries and reduce the fish catch. As a result, the price of local produce may increase and affect local economies well beyond the project location itself. Therefore, people who do live not just along the Salween River but in the entire region should support the communities along the river, because they could also suffer the impacts but they don’t realize it yet. Every community must have the full right to protect their land, their rivers, their forests and their cultures. Yet, the Myanmar government has not respected domestic and international laws, including those it is legally bound to follow. The Chinese company has also failed to abide by international standards. It is important that the conversation starts about the Ywarthit Dam amongst all of the communities along the Salween River. They need information about environmental justice, human rights, development, and relevant laws to strengthen their communities in protecting their rights. The Ywarthit Dam, however, is not only an issue for the Salween people but also your problem too. Please join the conversation!